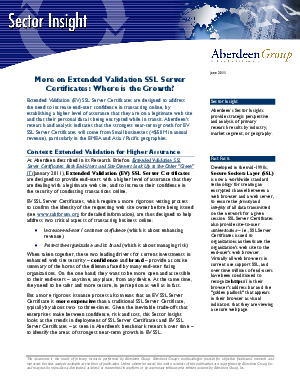 > Aberdeen Group > More on Extended Validation SSL Server Certificates: Where is the Growth? Extended Validation (EV) SSL Server Certificates are designed to address the need to increase end-user confidence in transacting online, by establishing a higher level of assurance that they are on a legitimate web site and that their personal data is being encrypted while in transit. Aberdeen's research and analysis indicates that the strongest near-term growth for EV SSL Server Certificates will come from Small businesses (<$50M in annual revenue), particularly in the EMEA and Asia / Pacific geographies.